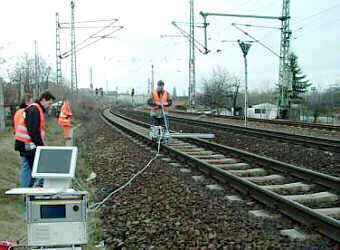 Using a rail-inspection train, the Deutsche Bahn's system of railroads is continuously checked for traffic-induced defects. Until now, only ultrasonic inspection was used. In addition, eddy-current inspection could successfully and efficiently be used to detect and evaluate certain surface cracks - so-called head checks. There have already been reports about laboratory tests which proved the general suitability of this test method [1,2]. The next step - described here - consisted of practical trials under real-life conditions. A test system which is able to fulfil the strict requirements (test speeds of up to 100 km/h, complex probe guidance, suppression of electrical and mechanical interference, recording of data, filtering and evaluation of data) was developed. As part of the rail-inspection train and as a manual system, this inspection system was successfully tested on the Deutsche Bahn's system of railroads under real-life conditions. The test system should enable the user to monitor the development of a defect, optimally plan the repair of defects and check on their success. Thus, a modern quality-management of the system of rails becomes possible and valuable pieces of information regarding the future design of track systems are gained. Figure 2 depicts the schematic diagram of the inspection system that was used. A commercially available 2-channel eddy-current instrument was used. The probes were custom-designed for this application. They have a very small length of coverage, but offer an unusually deep penetration of the material. In addition, the lift-off effect of these probes is very small. To reliably evaluate the measured signals, at least five measured values must be saved within the length of coverage of the probe. Based on a length of coverage of 3 mm and a test speed of 28 m/s (100 km/h) the scan rate is approximately 50 KS/s. If 6 channels are used (2 EC-probes featuring 2 channels each; 1 channel for the local trigger and 1 channel for additional information) at 12 bit each, 1 MB of data are generated per second respectively 3.6 GB per hour. An A/D-board with 8 differential channels and 1.25 MS/sec and a Pentium III computer (550 MHz, 256 MB onboard, 18 GB SCSI hard drive) were used. A CD-RW-burner and a HP-DAT-streamer were to be used for data storage and the subsequent evaluation of the data. This configuration ensured that the data were recorded by the computer. To find specific indications again, a GPS (global positioning system) was used in addition to the path data supplied by the train. The coordinates are saved as part of a fixed interrelationship with the measured data. This is a very useful quality-management measure which makes it possible to easily allocate the positions later on. 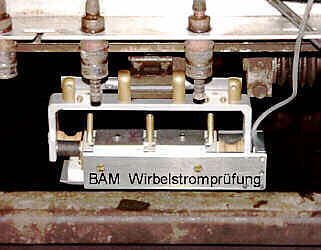 To simulate the high speeds of the rail-inspection train, a rotary test standard as depicted in figure 3 was manufactured. When rotated at 1,800 rpm, the standard which has a diameter of 230 mm reaches a peripheral speed of approx. 22 m/sec (78 km/h); this is about the same as the nominal test speed of the rail-inspection train. A turning lathe was used to rotate the part. The maximum speed of 3,000 rpm made it possible to simulate a test speed of 36 m/sec (130 km/h). 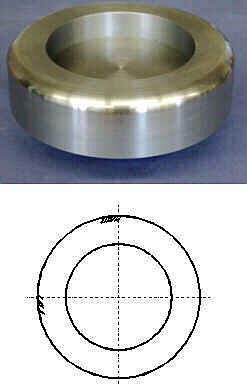 The rounded circumference of this test standard represents a model of the gauge side of the rails. Two crack patterns were electro-eroded into the circumference. Such crack pattern were used earlier for laboratory tests; they were, however, used in plates which were scanned with linear units. Illustration 4 and 5 depict the consistency of the signal course of the various samples. Except for an amplitudinal factor the amplitudinal proportions and the signal course are almost identical. During the rotary test, the height of the signal remained independent of the speed up to a speed of 78 km/h. At a speed of 100 km/h the signal was reduced by approximately 3 dB. This was caused by the eddy-currents system's low-pass filter. If tests will regularly be carried out at such a speed later on, the dimensions of the low pass should be modified. It is very important to guide the probe accurately relative to the test surface. So the signals are not influenced and the sensitivity does not fluctuate because of the lift-off effect. The test situation is especially complex, since it must be ensured that the probe is positioned at an angle relative to the guiding surface. In addition, there are the high speed and the difficult surface conditions that are due to the varying degrees of wear and tear. Two probe carriers were tried. One was a modified sliding block which is usually used to guide the ultrasonic probes. It was equipped with two probes (guiding surface and center position) (please refer to figure 6). The second carrier was a device which guided the probes across the guiding surface at a distance of 0.5 mm; here the probes were located between two rollers. Fig 7: Indications of Head Checks on a Ground Rail. The excerpt of the measured data shown here represents 1,596 mm. The first tests with the new technology were successful. In a selected section between Magdeburg and Eilsleben (Germany) several areas which were damaged by head checks were found. A very impressive example is depicted in figure 7. Near Magdeburg's main station remainders of head checks were found in an approximately 800 mm long section of previously ground rails. Based on the information available, one has to assume that when taking the relative position into account, the damage is approximately 0.25 mm deep; this means that most likely these cracks could have been removed if the rail-grinding train had ground the rails one more time. These indications were clearly confirmed during a manual inspection with an inspection trolley (see figures 8 and 9). Such precise results could only be obtained with the roller-guided system. The probes that were installed in a sliding block did not provide any usable results under these conditions. 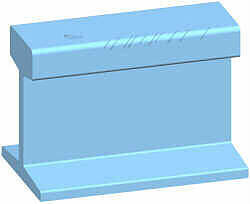 The advantage of the sliding block is the simple design that is also compatible with the ultrasonic technology. Unlike the roller-guided system a lift-off is not required when passing over gaps in the rails (e. g. near switches). For this reason, the roller system has only been tested at speeds of up to 40 km/h. The sliding block could be operated at speeds of up to 78 km/h without any problems. A test result featuring indications of head checks that was obtained with the sliding block is depicted in figure 10. The result was obtained near the A14-overpass. The exact position can be derived from the GPS-coordinates shown in the display. At the time the train was moving at a speed of 72 km/h. The probe registered numerous indications along the guiding surface. The probe that moved along the center position, however, did not display anything out of the ordinary. Thus one can conclude that the damage was caused by cracks along the guiding surface - so-called head checks. Figure 11 depicts a section that is 180 mm long. Here, one can see that the quality of the recorded data is excellent and the evaluation of the shape and height of every single indications is possible. Fig 10: Display featuring Indications of Head Checks in the Area of Guiding Surface (diagram in the middle). The upper diagram shows the probe signals in the middle of the rail. On the left: the corresponding GPS-coordinates and information regarding the test speed of 72 km/h. Fig 11: An excerpt of 180 mm of the measured data recorded at 72 km/h indicates the high quality and good readability.